Free download Call of Atlantis PC game. It is a puzzle game developed by My Real Games. Call of Atlantis game a little bit similar to Zuma’s Revenge game. Call of Atlantis is available free for your PC. The game is very interesting and can engage you for long time. 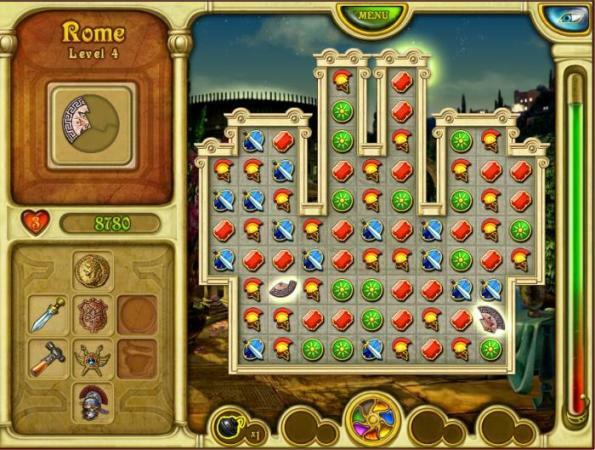 The game play of Call of Atlantis is very simple and you have to play this game with mouse. You can download the game Call of Atlantis from the download link given below. After downloading, run the setup and install the game. After installation, the developer’s page will be opened into your default browser to tell you that the game has been installed successfully. Now you are ready to play the game. At the start of this game, you have to unlock Altar by removing seals. There are seven different seals represented by different nature elements. There are also 7 items at the right side of the game. You have to pick and drop the item at the related seal to remove it. For example, you can use Sunflower to remove the Seal of Sun. After removing these all seals, map will be opened to start your mission towards different nations. These nations are Rome, Greece, Troy, Phoenicia, Babylon, Egypt and Carthage. You will start with Rome and there are six levels in Rome. You will see some elements on the board. You have to swipe two nearby elemetns to join them with same two. If there are no related item on swipe, you cannot move. If matches, elements will be destroyed and dropped more.